Almost immediately after the invention of photography was announced in 1839, Sir Francis Ronalds conceived the idea of a "movie camera" to enable continuous scientific observation without repetitive human effort. Its unique feature was that the photosensitive surface travelled slowly past the aperture diaphragm of the camera box in a long case, driven by clockwork. In this way the minute by minute variations of a physical parameter could be recorded over a 12- or 24-hour period. Sir Francis was able to build his first machines in 1845 for the Kew Observatory. Different models monitored atmospheric pressure, temperature, humidity, atmospheric electricity and geomagnetism. The British Prime Minister awarded him a £250 prize because of the importance of the invention for observational science. Sir Francis provided his cameras to other observatories both in Britain and abroad. Examples survive at the Science Museum in South Kensington and the Museum of the History of Science at the University of Oxford. 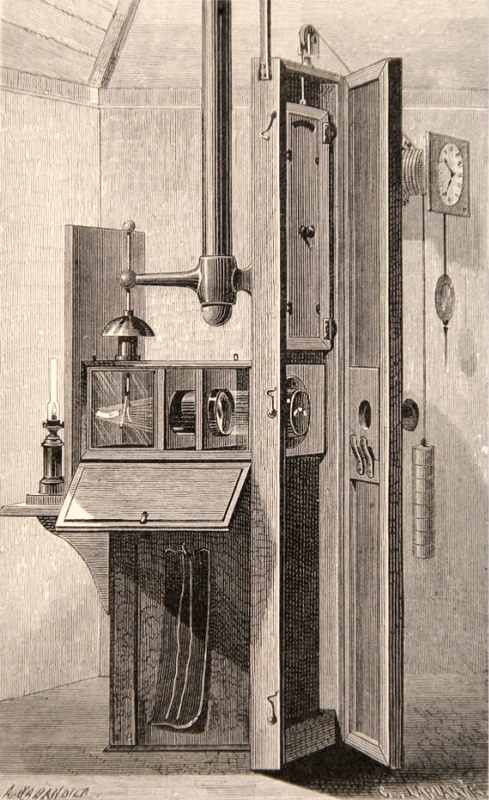 Beginning in 1862, the traces from his automated photo-barometer at the Kew Observatory were used in the UK's earliest official weather forecasts, published in The Times. A few years later, the Meteorological Office was established, having a series of observing stations around the UK each supplied with Sir Francis' cameras. The observing network was coordinated from the Kew Observatory. Its success resulted in many more of the machines being sold around the world. Some were in use for over a century and together they delivered wide scientific and social benefit in helping to understand the weather.